Every year, we celebrate the achievements of WAAPA’s most outstanding students through the presentation of scholarships and prizes. These awards are only possible through the generosity of private donors, the business sector, members of the public, past staff, alumni and various foundations. 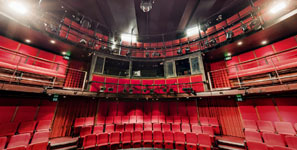 The D’Arcy Slater Performing Arts Scholarship is supported by the D’Arcy Slater Foundation, whose aim is to provide Australian youth with the means to realise their aspirations and potential in either education, sport, music, theatre and the arts and to provide domestic or international training in all fields. It provides financial assistance to students enrolling into the first year of the Bachelor of Arts (Acting) with a scholarship valued at $5,000, paid over the three years of the course. The D’Arcy Slater Foundation also offer two Travelling Scholarships valued at $2,000 each and funds for Visiting Artists. To apply and for more information, please visit the ECU Scholarships web pages. The ECU WAAPA Scholarship is open to Western Australian year 12 school leavers displaying outstanding academic excellence and endeavour. You are encouraged to apply if you are nominating ECU as your first preference of university through TISC, or if you apply directly to ECU for the Western Australian Academy of Performing Arts (WAAPA) undergraduate bachelor degree courses. The scholarship offers a payment of $2,500 per semester (or pro rata for part time study) for a total of $5,000 per year for the duration of your course. The Feilman Foundation First Fleet Restoration PhD Scholarship will be responsible for documenting and researching the restoration of these historic pianos, including extensive engagement with master restorers, technicians, and instrument- builders. The scholarship provides a stipend of $35,000 per annum and a research budget of $15,000 per annum (primarily for travel costs), for up to four years. To apply and for more information, please visit the ECU Scholarships web pages. The Kevin Button and Susie Lim Scholarship was established to support Aboriginal and/or Torres Strait Islander students and students in financial hardship during their studies at WAAPA. The scholarship is offered as away of encouraging and supporting indigenous and disadvantaged students to continue with the demanding WAAPA courses. The scholarship awards a one off Tuition Fee Credit (for VET students) or payment (for Undergraduate students) of $2500.00. To apply and for more information, please visit the ECU Scholarships web pages. The Norman Archibald Percussion Scholarship was established in 2015 to support meritorious classical percussion students enrolled in WAAPA's Bachelor of Music. The scholarship will provide financial support to students who demonstrate excellence in classical percussion thanks to the generosity of the donor Mr Neil Archibald. The scholarship offers a once off payment of $2,000 to the successful applicant. To apply and for more information, please visit the ECU Scholarships web pages. The Paulette Carson Scholarship was established in order to provide young classical ballet dancers with the opportunity to fully realise their ambitions and dreams. Three scholarships to the value of $7,500, are available for graduates of the Advance Diploma of Dance who are entering the Bachelor of Performing Arts Course. To apply and for more information, please visit the ECU Scholarships web pages. The Stacey Scholarship will support one male classical voice student, who has demonstrated excellence in Bachelor of Music (Classical Performance – Vocal). The Scholarship has been created to recognise those who are experiencing hardship but excelling within the course. This scholarship is valued at $5,000 which will be given as a fee credit for the course. The ECU WAAPA Scholarship is open to Western Australian year 12 school leavers displaying outstanding academic excellence and endeavour. You are encouraged to apply if you are nominating ECU as your first preference of university through TISC, or if you apply directly to ECU for the Western Australian Academy of Performing Arts (WAAPA) undergraduate bachelor degree courses. Value: $2,500 per semester (or pro rata for part time study) for a total of $5,000 per year for the duration of your course. The Kevin Button and Susie Lim Scholarship supports Indigenous and disadvantaged students to continue with their studies at WAAPA. The D’Arcy Slater Foundation was established to provide young Australians with the means to realise their aspirations and potential in Education, Sport, Music and the Arts. Since 2009 the D’Arcy Slater Foundation has contributed funding to WAAPA in the form of Acting Scholarships, Secondment Scholarships and through supporting the visiting artists program. Value: $5,000 over three years. Rewarding leadership in the Arts Management course. The Paulette Carson Scholarship was established in order to provide young classical ballet dancers with the opportunity to fully realise their ambitions and dreams. Three scholarships are available for graduates of the Advance Diploma of Dance who are entering the Bachelor of Performing Arts Course. The Norman Archibald Percussion Scholarship was established in 2015 to support meritorious classical percussion students enrolled in WAAPA's Bachelor of Music. The scholarship will provide financial support to students who demonstrate excellence in classical percussion thanks to the generosity of the donor Mr Neil Archibald. To acknowledge excellence in Ensemble in 2nd year. The Barbara MacLeod Scholarship enables Undergraduate and Postgraduate female students in Classical Music, excluding percussionists, to further develop specialist skills in their chosen field by undertaking an intensive program of study at another world-class institution. To acknowledge the excellence of a final year Bachelor of Music Honours (Jazz) student at their final graduation recital. To acknowledge the excellence of a final year Bachelor of Music (Jazz) student at their final graduation recital.